ADATA Technology launches the SD700 durable external SSD drive featuring a military-grade shock proofing provided by the durable protective enclosure developed through rigorous tests. The ADATA SD700 uses a 3D NAND SSD that is also dust-proof and waterproof. The SD700 durable external SSD uses USB 3.1 Gen1 connectivity that offers 440 MB/s read and write speeds. The ADATA SD700 is compatible with Windows, Mac OS and Android devices. The ADATA SD700 is also lightweight with it only weighing at 100 grams. The ADATA SD700 is designed and certified with the IEC IP68 standards. This certifies that the SD700 is sealed tight to prevent dust from entering the internals. This also certified the waterproof qualities of the SD700 with it resistant to water even after submersion in 1.5-meter deep water for 60 minutes. 3D NAND is the latest in flash memory technology making storage devices faster, more reliable and larger in capacities. With that, the ADATA SD700 comes in 256GB, 512GB, and 1TB capacities. With the USB 3.1 Gen1 connectivity, streaming 4K content will be smooth and continuous without buffering and lag. The SD700 weighs only at 100 grams with a very sleek and compact design for mobility. It operates in complete silence and at cool temperatures. The ADATA SD700 durable external SSD is available a two-tone yellow and black color and all-black color schemes. 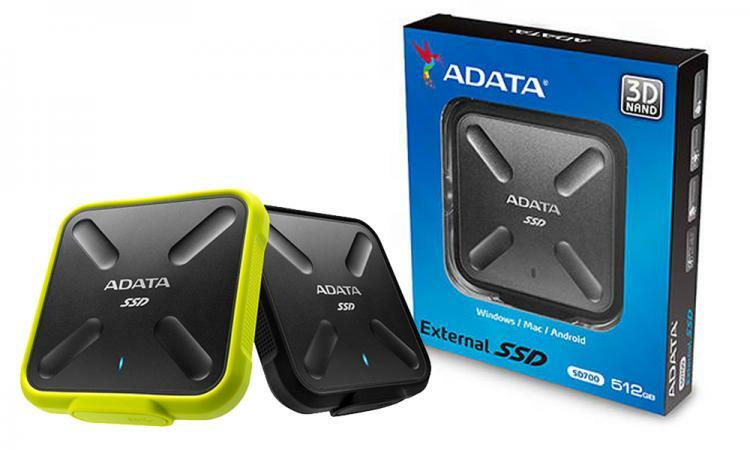 Visit the ADATA website for more information on the SD700 external SSD portable storage drive.